I am Trying to Create custom report type same as like "Opportunity with Partners" Standard report based on one of my requirement. But i am not able to see the below information in any object. 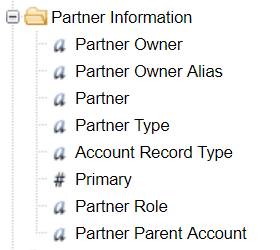 Can you please help me how to add the Partner Information in Custom report type? Partners are the companies with which you collaborate to close your sales deals. For each opportunity or account you create, the Partners related list allows you to store information about your partners and the roles they play in the opportunity or account. Because you cannot create a relationship on the Partner object itself to any of the custom object (or any other standard object), you will not have the object available as selection while creating the custom report type (anything other than Opportunity or Account). Not the answer you're looking for? Browse other questions tagged reporting custom-report-type or ask your own question.